A career in trucking is very rewarding, but it also comes with a few drawbacks. One of the most significant disadvantages is the negative effects it can have on your health, as sitting for long hours every day can take its toll on your body. 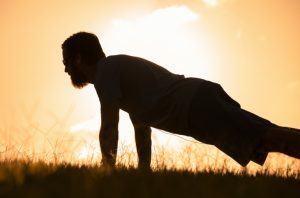 While it can be hard to find the time to work out, do your best to complete these three simple and quick exercises while on the road to stay fit and live a healthy lifestyle! Air squats are very simple to do, but they are effective for toning your upper and lower body. This exercise requires no equipment and can be done just about anywhere, so it is perfect for truckers! Stand with your feet slightly wider than your hips, and point your knees and toes slightly outward at a 20-degree angle. Try to increase the number of squats you complete each day to see the best results. Also, if you want to challenge yourself a little more, hold a heavy object from your truck while you squat. A plank is another very effective exercise move that requires no equipment, all you need is your body and a soft place to lay on your elbows. Planking is great for improving core definition, decreasing your risk of back injury, as well as boosting your metabolism. Simply lay on your stomach, clasp your hands together, then lift your body up onto your elbows. Start with a 30-second plank, then increase every day- you will be surprised how quickly you will be able to increase your time! Also, you can incorporate a few single arm planks by turning to the side and balancing your weight on each arm. If you are looking for an exercise with minimal equipment, a resistance band is key. Every trucker should have a resistance band in his or her truck, as they are useful for a variety of different workouts. Place the resistance band above your knees and stand with your feet hip-width apart, then squat and take small steps to the left and repeat on the right. By taking 30 minutes out of your day to exercise and get your heart rate up, your body will thank you for keeping it healthy and active while on the road. This entry was posted on Friday, October 26th, 2018 at 6:15 pm	and is filed under Road Travel. You can follow any responses to this entry through the RSS 2.0 feed. Both comments and pings are currently closed.